We are an office supply manufacturer and wholesaler. 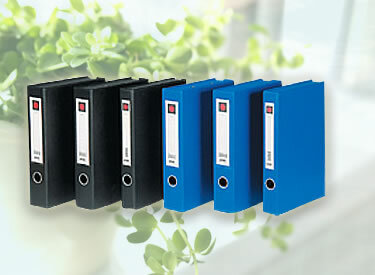 We can provide kinds of office supplies, our office files are of good quality and reasonable prices. Here is our PVC box file. If you click the icons below this picture, you will turn to other similar products pages. They are for different office uses. Welcome to choose upon your needs. 1. Rubber coating PVC material: water-proof and damp-proof. 2. Magnetic snap is available. 3. Durable: The file box is not easy to be out of shape. This kind of office supplies is suitable to be used in banks, insurance industries and enterprises etc. Deli, a professional stationery supplier, can offer various home office supplies. Welcome to contact us. » PP Box File1. High quality material guaranteed the high quality of this kind of office supplies. 2. The appearance of the PP Box File is beautiful. 3. Clapboard is available inside the A4 box file. » PP Adhesive Box File1. The box file is made of high quality PP material and its color is bright. 2. The A4 Box File has a neat appearance and it is durable. 3. Its special design enable a convenient retrieval.